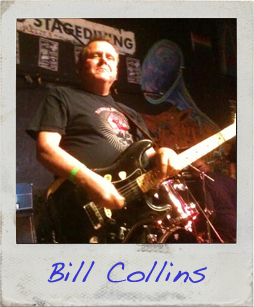 In 1976, Bill Collins played his first gig as a professional musician. Since then, he’s played punk squats and clubs all over the U.S. and Europe, in bands with names like Millions of Dead Cops, and Fang. He’s played cowboy bars in Montana, Irish pubs in Connecticut, Union rallies and picket lines up and down the East Coast—even recorded a couple of LPs in Nashville. For most of Bill’s life, songwriting is what scratched his storytelling itch. These days, he’s seeing what it feels like to strip away the music and the rhymes, leaving just the stories. After 20 years in New Haven, Connecticut, Bill once again resides in Berkeley, California, where he’s making music, teaching guitar and working on his first book, a memoir focused on his big sis, Jeanette. You can learn more about Bill at www.billcollinsguitar.com. Read the first page of Bill’s story!